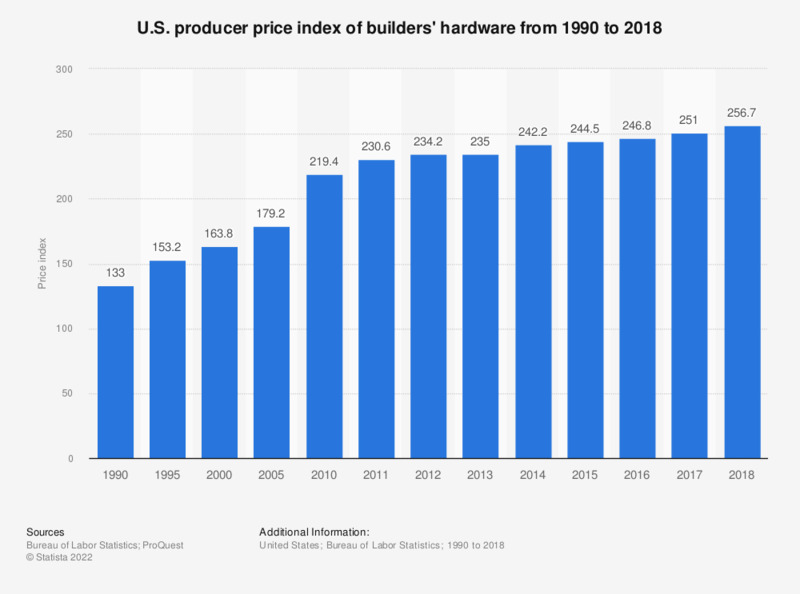 This statistic represents the producer price index of builders' hardware between 1990 and 2017. Builders' hardware had an index of 251 in 2017, compared to 100 in 1982, which was used as the base year. * 1982 was used as the base year (1982= 100). Includes: lock units, key blanks, door and window hardware, cabinet hardware, etc. This index, more formally known as the special commodity grouping index for construction materials, covers materials incorporated as integral part of a building or normally installed during construction and not readily removable. Excludes consumer durables such as kitchen ranges, refrigerators, etc. This index is not the same as the stage-of-processing index of intermediate materials and components for construction.